Handcrafted elevator boots with upper in fine dark green Cordovan leather featuring a natural vintage look, side zip and laces. Sole in natural rubber. The inner elevator system is able to increase height up to 4 inches (10 cm). 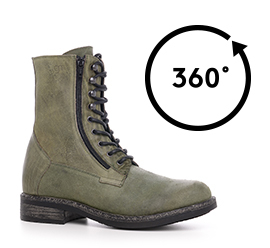 A boot with a unique vintage effect to enhance any casual-chic look.